Question: What advantages does the bronze #4 have over the cast ductile iron version? Answer: On a basic level, the bronze #4 is very similar to the cast-iron version of the #4, with all of the “working” parts behaving the same. Now for the differences: bronze is a fair amount heavier than cast-iron, which of course carries over to the plane (Iron 4 lbs, Bronze 4 1/2 lbs), which can be beneficial during your planing. 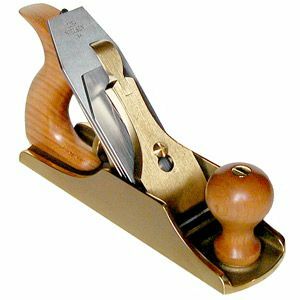 This benefit is from the extra mass of the plane tending to want to keep moving through the cut, even if the wood is a bit inconsistent. Simply put, once you start the plane, it feels more like you just steer the plane and let its momentum do the work. Another comparison between the bronze and the cast-iron is the potential for rust. If you happen to live or work in an area that is close to a large body of water, you likely need to pay special attention to your tools, in the attempt to prevent rust. Bronze will not rust, so is ideal in these rust-prone scenarios, but the outside surfaces will still slowly oxidize. During oxidation there is a change in the surface from gold-colored to a slightly darker color initially, and if left for a longer period of either non-use or non-contact it will become a warm, muted version of the original color. If a bronze tool is used regularly, there is no reason to do anything special to any of the surfaces, since the constant use will prevent oxidation to the areas contacting the wood. Some woodworkers find the change in color on the non-work surfaces unpleasant to their eyes, and if you wish to retain the original beauty of the bronze, it is a very easy task. The easiest solution is to purchase a “Sunshine” polishing cloth, with which you can very quickly remove any discoloration or oxidation. If you haven’t used your bronze tool in quite a while, some oxidation will likely occur on the working surface (sole), which can leave some discoloration on the wood surfaces it touches The discoloration will be more pronounced on lighter woods like Maple. With this in mind, if it has been a while between uses, it is a good idea to wind the blade into the body of the plane, and do a quick polish of the plane’s sole. 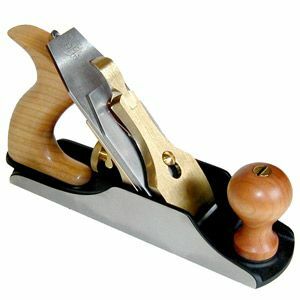 This will prevent any unexpected issues during your work on your project, while utilizing the beneficial heft of the bronze planes. The Plane Facts: What’s So Special About This Ductile Cast Iron?